Edible gardening is all the rage in Melbourne right now, and it’s a trend you want to be part of. An edible garden offers so many benefits. Firstly, you get a fresh food section in your own backyard, and nothing is tastier or healthier than vegetables you have grown yourself. Secondly, you’ll be doing your bit to create a more sustainable world. The practice of growing and transporting vegetables from all over the country (and even the world) increases our carbon footprint, so if you can get tomatoes, broccoli and strawberries from your backyard, you won’t have to rely on that semi-trailer delivery to Woolworths. 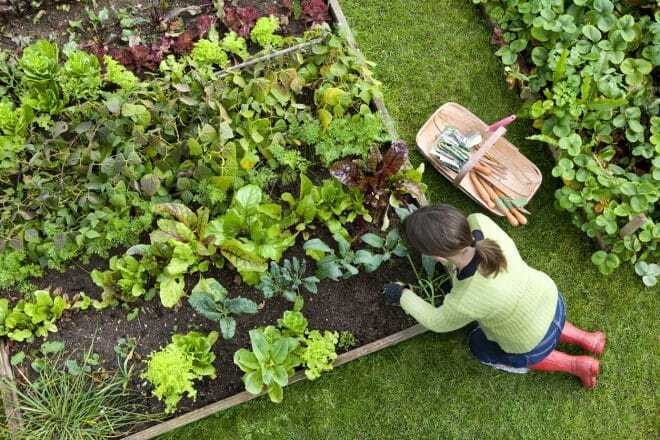 And to top it all off, you’ll enjoy better mental and overall health by getting out in the garden and enjoying the feeling of tending and growing your own food. If you have young kids, they’ll love getting outside and helping you turn the soil, plant the seeds and water their little patch of life. So, here’s a guide to introduce you to the wonderful world of edible gardening. Spring is a fantastic time to begin your edible gardening journey. It’s also a busy time of the year for the gardening world because the increased temperature, rainfall and sunlight mean everything will start growing like crazy, and that includes weeds. As the heat turns up and the rain dries up, there are still plenty of opportunities to turn your garden into a backyard supermarket. So, Where Are The Hints and Tips? Space: An edible garden doesn’t require an acreage. In fact, all you need is a pot to begin your journey. Whether you have a courtyard, a balcony, or even a windowsill, all you need is a bit of sun and some soil, and you can start planting edibles. Positioning: The best position for your edible garden will depend on what type of edibles you want to grow. Some grow better in the shade, while others need full sun. So, do your plant research before you decide on the position. Soil: You need to create the right type of soil to promote growth, so make sure you design a garden with well-draining soil and a good amount of organic matter. Other Infrastructure: Think about what else you need, like a gardening shed, bench or cupboard to store all your materials. Of course, you can build your own garden bed with some old railway sleepers. You can find these at your local hardware store, and they’re perfect for creating vegetable garden beds. You can even stack them on top of one another to make the bed as deep or shallow as you like. Having a drainage rate of 2.5 to 15cm per hour. You can judge your drainage rate by digging a few small holes about 60cm deep. Fill them with water and let them drain away, then refill them and time how long it takes for the holes to drain again. Follow these tips, and choose the right vegetables and your spring and summer will set you up for veggies you can enjoy all year long. An edible garden really is an asset to your health and your home. Join the movement and start growing your own food.